Factor, a now deceased Chickasaw Indian, confessed before he died that he was involved in the assassination. Shortly before the fatal gunplay, Mr. 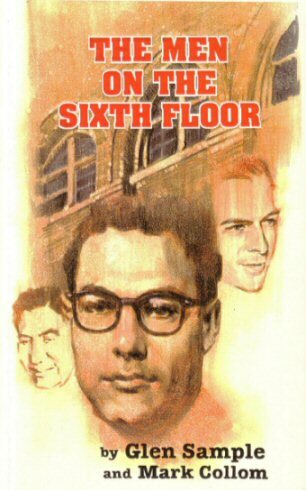 Factor also observed Oswald and another co-conspirator, one Malcolm Wallace, on the sixth floor " . . . sitting near a table saw, adjusting rifle scopes." "Three days before the killing, Factor was driven to a small house in Dallas. There he reviewed plans, maps and routes with the others involved. Ruth Ann, a pretty, young Hispanic woman, drove him to the book depository building shortly before the motorcade was to arrive. The pair climbed to the sixth floor, where Oswald and Wallace already were. Ruth Ann carried a walkie-talkie with which she communicated with other unknown individuals. Oswald, Wallace and Factor each had rifles. At the approach of the motorcade rounding Elm street , Ruth Ann counted down the signal - "One . . . two . . . three" - while at the same time waving her hand downward on each number. On the down stroke of three the gunman fired a single shot each, then fled quickly down the stairs - Ruth Ann and Factor to their parked car, Oswald and Wallace in different directions. Loy was driven to the bus depot, a few blocks away where his was to catch a bus back home. But in a short while Ruth Ann and Wallace both returned to the depot to pick up Factor and drive him out of town. (Probably because Oswald had been captured.)" This researcher proclaims "How can we be sure that Factor was telling the truth? Details" Since the truth is in the details, let's examine and question some. Question # 1 - Here we have three shooters spaced at known (each is at an open window) intervals on the sixth floor. At least two have been adjusting their rifle scopes. Take time to look at the photographs of the sixth floor shortly after the assassination. See the rows of pallets full of book boxes. Carefully observe the "sniper's nest." Now determine where Ruth Ann had to be located to be seen waiving her arms in the effort to coordinate the shooting? Somewhere near the ceiling I suspect. Question # 2 - How could three shooters lining up Kennedy in their rifle scopes observe Ruth Ann waving her arms? No matter which eye the rifleman used to site the target, how far would the other eye need to be rotated to observe Ruth Ann? Question # 3 - Since all three fired upon Ruth Ann's third down stroke, why doesn't any ear witness describe three simultaneous shots or one loud concurrent blast? Question # 4 - How did the rifle carrying duo of Factor and Wallace enter the Depository? How did Factor and Wallace, transporting weapons, as well as, Ruth Ann exit the building unobserved? Question # 5 - Ruth Ann and Factor leave together by car while Oswald and Wallace leave "in different directions." How does Wallace get to Ruth Ann's vehicle for the trip to pick up Factor at the bus depot? Why does Wallace return to Ruth Ann's vehicle but Oswald doesn't? Question # 6 - "But in a short while Ruth Ann and Wallace both returned to the depot to pick up Factor and drive him out of town. (Probably because Oswald had been captured.)" Unless I'm mistaken the assassination occurred at 12:30 PM and Oswald's capture around 1:50 PM. Notice of Oswald's apprehension was not broadcast until "within an hour of Oswald's arrest." (15H55) Are we to assume Ruth Ann and Wallace cruised around downtown for almost two hours before returning to the bus depot? Would you consider two hours a "short while?" Question # 7 - As additional corroboration of Factor's truthfulness we are reminded of the table saw the gunman observed. To make the point we are introduced to former Depository employee, Harold Norman (now deceased). Norman correctly indicates the floor was rotten in some spots and plywood was being put down as a replacement. Norman then sifts through the mists of thirty years to say he remembers that "there was a table saw, near the eastern end of the sixth floor." Now there is absolute confirmation for you. Has anybody seen any photograph showing a table saw on the sixth floor? Question #8 - If Factor is telling the truth then what can one say about others who have named different individuals as being on the sixth floor? Are they lying? Are they those shadowy disinformation specialists we hear so much about? Maybe Henry Hurt should again interview Robert Easterling who placed Manuel Rivera on the sixth floor. (See page 356 of Hurt's Reasonable Doubt) What about Ricky White's "Lebanon" or Prensa Latina's Lenny Patrick? Could there be six shooters and Ruth Ann roaming around up there? What if the Warren Commission used similar investigation, evidence and proof to conclude Oswald was not only a co-conspirator but a shooter. Do you think Marina Oswald or her two daughters would quietly slip into the shadows. I can hear Marina now, "Thank heavens for Loy Factor . Here I thought Lee was a victim of the scurrilous government. Boy was I wrong." With all of the conflicting theories, poor or nonexistent research, phony death threat fables, fake mysterious death stories, contradictory book conclusions and lawsuits, just what percentage of the American public believes us?